The vinification process benefits from the use of modern equipment : a light pressing and destalking for certain vintages ; with fermentation carried out at automatically regulated temperatures. All give our wines a more delicate and fruity flavour and allow them to age well. A twenty day maceration allows the full extraction of fruit flavours. The juice more firmly fixes the fruit aromas and the colour contained in the grape's skin. 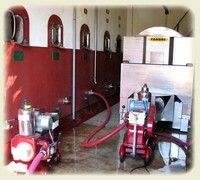 After fermentation, the wine is left to settle and then decanted into vats. The wine is kept in vats for a long time to encourage its ability for extended ageing and to develop complex aromas. Certain vintages are aged in casks for up to one year before being bottled. Bottles are stored at a constant temperature of 15 degrees centigrade. Our very best wines, sold in distinctive bottles with the Châteauneuf-du-Pape coat of arms, develop their complex aromas and flavours after three to five years, reaching their full maturity and complexity after seven years. They can be kept for up to twelve years. Our estate also produces excellent Côtes-du-Rhône which is a perfect complement to our Châteauneuf-du-Pape. The abuse of alcohol is dangerous to your health. Understand and know this and consume alcohol in moderation.